Please read this document carefully and in its entirety, as we have recently changed some information. What is BYOD and how does it work at PCHS? BYOD is an acronym for “Bring your own device”. Instead of the school providing devices or mandating one specific brand and model, we are requiring all students to bring a device which meets our minimum specifications. Each teache r will have students use the devices differently. Some may have students conduct research in class, some may have them take formal and informal assessments, some may have them complete writing assignments, some may use interactive websites and apps, and others will have students collaborate on an activity. In some classes, student may use their device almost constantly, while others will leave it up to the student to decide whether or not to use their device to take notes or access an e-book. Why did the school choose BYOD instead of requiring every student to have the same device? At PCHS we want the focus to be on student learning, not a device. Technology is a tool that leads to learning, not the other way around. Many of our students already use a wide variety devices for both academic and non-academic use. We want to train students to use their devices for academic and personal productivity, not just for entertainment and social media. We also want to provide teachers and students the freedom and flexibility to choose the right tool/app that will help accomplish the learning goal(s). Technology evolves at a very rapid pace; we didn’t want to lock users into a specific model which can potentially lock them into obsolescence. Families can choose to update their device as the student’s needs change. A device that is appropriate for a freshman may not meet the needs of a senior who is almost ready to go to college. Student can use the device with which they are most comfortable. They can also choose the device that is best for both school and non-school needs. Will devices be used in every class? Yes. There will be many classroom activities which require laptop use, and students are allowed to take notes using their devices. Please be aware that classroom use on any given day depends entirely on the teacher’s judgment about the best tools to use for learning. Technology is a very powerful tool for engaging in academic work, but it is certainly not the only tool that PCHS teachers and students will employ. Many teachers will encourage frequent use of devices, but there will be times when students will not be permitted. Laptop use is always subject to the specific permission of the classroom teacher or other faculty member. Does my child have to bring a device or is it optional? All students are REQUIRED to bring a personally-owned device each day in the same way that they bring other learning materials like textbooks, pencils and notebooks. Do I have to buy a new device or can my student use one that we already own? You do not need to purchase a new device as long as the one you own meets the minimum specifications. Battery life may be a concern for all devices, but especially older ones. In that case, our suggestion is to purchase a new battery instead of purchasing a new device. ** What are the dev ice requirements? We have definite restrictions on the type of device. Students are required to bring a laptop or convertible (hybrid) 2-1in-1 laptop. While students may prefer to use their smartphone as their sole BYOD device, a phone does NOT meet the minimum BYOD specifications. (Smartphone use is not allowed during the school day. They may be used only with teacher permission.) Laptops have larger screen size and keyboards, both of which contribute to ease of use. Additionally, a touch screen and stylus will hep students to use their laptops for even more uses, such as math and science problems, sketching, editing, flowcharting, etc. See the minimum specifications for complete information. ** What’s the best device? As long as it meets our specifications, there is no “best device”. Students and families should choose a device with which they are most comfortable. PCHS believes that any device that meets the minimum specifications will work for our students. We believe that a laptop with Windows operating system, having at least a 10 inch screen, full-size keyboard, touch screen and stylus will work the best in our school setting. No seriously, what’s the best one? The best laptop is one that the student is familiar with and knows how to use well. We will have BYOD set-up sessions for students prior to the start of the school year, but we also encourage students to use their laptops prior to the start of the school year, and watch video tutorials so that they are very familiar with them. What other factors should we consider if we are buying new? Consider factors such as price, battery life, durability, and length of time you realistically expect to use the device. Also important to remember is the portability. While a large screen is great, it also means that your student will be carrying around a larger laptop that might not fit in a backpack. Don’t forget about a protective case or sleeve. If families are interested in purchasing a refurbished laptop, be sure that it comes with a warranty. We have had good luck with refurbished devices, and have gotten some great deals! Students are welcome to bring a device that they already own as well. Either way, just make sure it meets our minimum specifications. I’m still worried that I will buy the wrong device. Not to worry! In spring, we will provide you with special PCHS-only websites from several vendors (Dell, CDW, Microsoft). All devices offered on these PCHS-only pages will be chosen because they satisfy our minimum specifications, so you can be assured of getting a great laptop that meets all our requirements. Purchase from one of these vendors is not necessary; we simply offer it as a service to all our current and incoming families. PCHS is a Microsoft school. Will MacBooks be allowed? No. This is new beginning with the 2019-20 school year. The faculty and administration agreed that a touch screen and stylus offers advantages for students. Currently, there are no MacBooks that have these features. Therefore, MacBooks will not be allowed for the Class of 2023 and later. Students in the classes of 2020, 2021 and 2022 are “grandfathered in” and do not need to purchase a new laptop to replace their MacBook. Will we need to purchase a data plan for my student? A data plan is not necessary. Once the student attaches the device to the PCHS wireless network, he/she will have internet access via our content filter. While on campus, students are required to access the internet ONLY via our network. They should not use their cellular plan. This will prevent unnecessary use of the data plan and will also protect students from inappropriate internet content. Will I need to purchase a “hotspot” so that my student can access the internet? A hotspot is not necessary. In fact, it is a violation of our Responsible Use Policy. All students will be instructed on how to attach their devices to our wireless network and to login to our internet filter with their username and passwords. Once a student completes those two easy steps, he/she can access the web. Please note that while on Wi-Fi, student web access is filtered. While no internet filter is perfect, ours will block most inappropriate content and other sites that can be a distraction to students, such as social media and games. Are there any recommended or required accessories? An extra charging/power cable that should be kept at school. Other accessories that are useful in certain classes: earbuds and/or a headset. The classroom teachers will advise students about having these items on hand. Can students carry their device in a protective bag? Yes. In fact, students are required to use a protective sleeve (with optional shoulder strap) for their devices. The bag should be large enough only to contain the device, power cable, earbuds/headsets. For safety and space reasons, students may not carry a traditional backpack or book bag. See some examples of acceptable sleeve case bags here at amazon.com. What if a family cannot afford the cost of a device for their student? PCHS will have a limited number of loaner devices for student use. Please remember that the use of loaner devices is intended to help students on a temporary basis only. If your family needs additional assistance, please visit the financial page of our website to learn about applying for aid and contact Mr. Ed Barrett about obtaining a device. What happens if the student’s device breaks? Will PCHS fix it? The Tech Office staff will assist students as much as possible. This includes troubleshooting a simple malfunction or Wi-Fi connectivity, changing software and operating system settings as needed, showing users how to perform a certain task. However, the Tech Office cannot repair hardware. This is the student’s responsibility. If the device breaks or is damaged, families are responsible to get it repaired. We highly recommend purchasing an extended warranty to help defray those expenses. Students are always welcome to visit to the Technology Office for assistance. We are happy to help answer questions about network accounts, Wi-Fi access, Office 365, StudentPlus, laptop issues, software and more. The Technology Office is open from 7:30 AM to 3:15 PM on days when school is in session. What happens if the battery dies during the school day? Can students charge their devices? This is one of the biggest problems with laptops! Students neglect to charge the laptop overnight and many do not have a power adapter at school, even though it is required. If students need to charge their laptops/tablets, each classroom is equipped with a power strip for student use (with teacher permission). We also have a charging lockers in the Blue Hallway, outside the Learning Commons, and in the cafeteria. These lockers will be accessible after school as well as during the school day. Students must bring the device’s power adapter or charging cable to make use of the outlets and charging stations. We also highly recommend using spare batteries or external power bricks if possible. Students should come to school with the battery fully charged. Battery life depends on many factors, particularly how the device is being used. Playing games, watching movies and unnecessary multi-tasking will run down battery life significantly. Students are expected to use their device in a way that conserves power so it is available for educational use during class. What are the recommended apps and software we should have on our devices? The list will can be found here on our website. It is updated at least semi-annually. Do I need to purchase a license for Microsoft Office? No! Please do not spendmoney purchasing Office! As part of our educational license agreement, students will be allowed to download Microsoft Office 365 on up to 5 devices including Windows tablets, iPads, and Android tablets. The licenses are valid as long as the student is enrolled at PCHS. During the summer, new students’ parents will receive an email with complete information on how to install Office365. Students should have this installed prior to the BYOD set-up sessions in late July/early August. Will teachers require students to purchase apps or will they all be free? Apps that the student us will be free. Families always have the option to purchase paid apps. Will all of my student’s textbooks be electronic now, or will I still have to purchase printed books? Families will have the choice to purchase either electronic or traditional textbooks. In many cases, e-books can be rented, saving parents even more money. PCHS has contracted with etechcampus.com as our textbook provider. Etechcampus offers families the option to purchase books in either format. Please be aware that not all textbooks are available in electronic format – that is dependent on the publisher. Read more about etechcampus..
What type of security does PCHS wireless network have? While we can’t get into specifics, be assured that we adhere to the latest industry standards for network security and protocols, and we keep up-to-date on all new security threats and protection. Can students plug in their devices to the network via an Ethernet cable? No. Students who BYOD may only access the network through a wireless connection, connecting to the Celticnet network. How will students access the PCHS wireless network? The Technology Staff will help freshmen and transfer students get started with their devices during BYOD set-up sessions before the school year starts. (Dates to be announced.) Students will learn to: connect to the Wi-Fi, login to our internet filter, access Office 365/SharePoint, check email, receive their StudentPlus login credentials, use OneNote for note-taking and organization, and more. Students are encouraged to visit the Tech Office if they have any difficulties. Tech office hours are 7:30 AM to 3:15 PM on most school days. Will students be allowed to print from their devices? No. Students should save documents to their Office 365 OneDrive account. If necessary, they can then login on a school workstation, retrieve the document from OneDrive and print. Teachers will be transitioning toward electronic hand-in when possible. Therefore, we expect students’ need to print will diminish over time. How will the students be kept on task and away from inappropriate use of mobile devices? We have high expectations for our students. Off-task behavior of any kind is often self-correcting. In the event that the teacher needs to intervene, he/she will address it in the same manner as they would for any other disengaged behavior. Teachers can, of course, tell students at any time to “shut down your device” in order to remove the distraction. Our Responsible Use Policy (RUP) clearly states that technology in school should always be in support of educational goals. Additionally, our content filter will prevent students from accessing the vast majority of inappropriate web content. Will my child be protected from photos/videos being published without permission? As stated in our RUP, students may not photograph, record audio, video or other digital media unless they have permission from both a faculty member and those whom they are recording. What if a student forgets his device and needs it for class? Students are required to bring a device every day for educational purposes, to enhance their classroom experience. However, we know that there may be occasional circumstances that may prevent the student from having their device, such as repair. We will have a limited number of laptops that can be checked out from the Learning Commons. Loaner devices may not leave campus; the student must return it to the Learning Commons at the end of the school day. Where may students use a device when not in class? 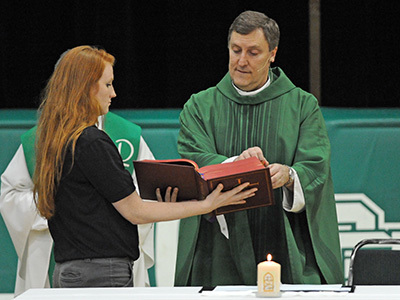 Devices may be used anywhere on campus except in the chapel, during assemblies/mass/prayer services, in locker rooms, bathrooms and any other place as deemed inappropriate by PCHS Faculty and Staff. 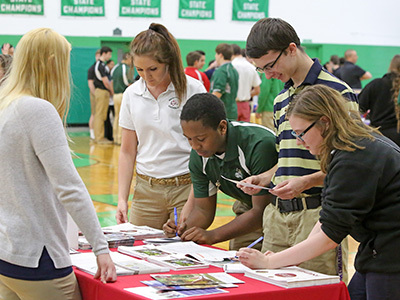 Use of devices at any point in the day, or at any school-sponsored event is subject to our RUP which was signed by parents upon registration to PCHS, and by all students at the start of each school year. Additionally, we encourage students to not use devices during lunch, and use the time to relax and socialize with peers instead. What kind of professional development will teachers be provided to make sure the PCHS is taking full advantage of the devices in the classroom and that they are used appropriately? Professional development for faculty is ongoing. We began preparing teachers during the 2012-13 school year with a year-long series of in-services and collaborative sessions. PCHS is committed to providing varied seminars, workshops and on-line tutorials to support teachers in taking full advantage of how BYOD and technology can enhance and empower student learning. Since students will have a variety of devices, all PCHS students will use a few uniform applications and portals, including StudentPlus and Microsoft Office 365/SharePoint. All PCHS students are provided a free Microsoft Office 365 account, which includes web apps for Word, Excel, PowerPoint, and OneNote. These online applications can be used from any internet-enabled device. Office 365 also includes Outlook, Microsoft’s email application and over 15 other apps. With the Office 365 account, each student is provided cloud-based storage on his/her OneDrive. Students can store and access data stored on OneDrive via any internet-enabled device. Students will learn to use all the features of Office 365/SharePoint during the Introduction to Technology class as well as their other classes. SharePoint works in conjunction with Office 365 and serves as our school intranet. 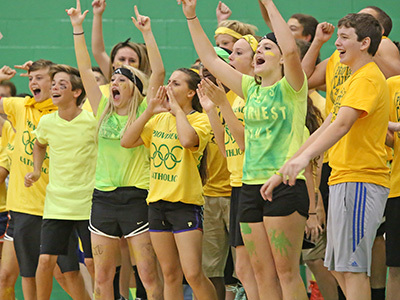 Documents, photos, videos and calendars are shared online for PCHS students and faculty. Each student is provided a personal email address via Office 365. 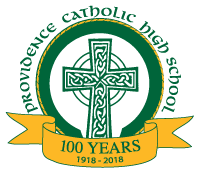 Student email addresses are part of the providencecatholic.org domain. Students are expected to check their email regularly for messages from teachers, peers and school personnel. What should students do their devices when not in use? While in class, teachers will instruct students regarding storage. Outside of class, students should store their device in a LOCKED locker. Students should never leave their devices unattended in open view. How can students keep their devices secure? It is extremely important that students secure their devices in a locker when not in use! Students should never grant others access to their hallway or athletic lockers by key or combination. In-season athletes are provided with a locker in his/her designated locker room. Students should be sure to keep all belongings in their assigned lockers and then lock it securely. Students also have the option to use the charging lockers after school. During the first week of classes, students will be required to register their device with PCHS. We will email a form which asks for student name, device make/model, and serial number. This information will help us identify lost or missing devices. This is a legitimate concern. Many devices are small, expensive and easy to resell. We encourage the use of stickers, labels or a unique case to visually customize and identify devices if they are lost. We suggest that families check their homeowners/rental insurance to see if the policy will cover theft or damage to a mobile device. We recommend that you install location-finding applications (e.g., Find my iPhone, Where’s my Droid). PCHS is not responsible for the student device if it is lost, stolen or damaged. What has PCHS learned during the first years of BYOD ? We have also assisted quite a few students who are not familiar with basic functions of their device. We cannot emphasize it strongly enough: students need to learn how to use the basic functions of their devices before the school year starts. Before the school year starts, we will host BYOD Set-up sessions. During the school year, we will assist them with Microsoft Office and other software as needed. But before school begins, they should know how to attach to a wireless network, open and close applications, download files, create shortcuts, scan for malware, perform updates and use good file and folder management practices. We have also seen firsthand that some students can be irresponsible with their devices. Many leave them unattended and unlocked, forget them in classrooms, and even put them on the floor where they have been stepped on. Accidental damage warranties/insurance policies are a really good idea! Lastly, battery life is the biggest challenge. Please remind your student to charge the laptop overnight so that he/she starts the day with a fully charged battery. Students must have a charging cable at school. (We recommend having one at school and one at home.) We also encourage students to take advantage of the charging lockers, and to use their laptops in such as way to conserve power. See more about battery life here. Because technology advances and new features become available regularly, we review and modify our policies and requirements. The most recent example is the new (for 2019-20) requirement of touch screen & stylus. When we launched the BYOD program several years ago, these features were not yet perfected, and increased costs significantly. Advances in hardware have made these features advantageous for our students. I have another question that you haven’t answered yet. Please email or call (815.717.3137) Technology Director Mrs. Rosanne Grigoletti for any other questions and information.